I haven’t been to Sculpture Square in a long while since I have returned to Singapore a year ago. From this visit, I can safely say Sculpture Square is having a revival of sorts, under the helm of artistic director and curator, Alan Oei, who was appointed in August 2012. The iconoclast series is perhaps a test and testament to Alan’s intent to transform this contemporary art space—from a laid back almost anything-goes-and-forgotten art space to one that challenges the Singapore viewers’ understanding of Singapore art histories and aesthetics sensibility. The first of the iconoclast series features Cheo Chai-Hiang’s 5’ x 5’ (Singapore River) (1972) and this is a significant in a few ways. First, as a series it promises to re-appraise artworks that had a significant impact on Singapore art, linking contemporary art to our near past. Second, a point in case to evaluate our own understanding of art before and today, and identifying the urgency to document art and artists. Third, illustrate the complexities of so doing. 5’ x 5’ is often regarded as the first moment in Singapore’s art history where a Singapore artist tackled conceptualism and challenged the status quo definition of art in the 1970s. This was done by submitting a conceptual piece of artwork, containing a set of instructions in a lengthy personal letter by the younger Cheo for an art exhibition by the Modern Art Society. For Cheo and other artists, the Singapore River represented the history, legend, and dilemma for a modernizing, young and small nation. The Singapore River was thus the object of representation of all things Singaporean, and by some small measure, a test piece for painters. A painter who could paint the Singapore River differently, in a captivating and enchanting manner might sell it to locals and tourists. Cheo didn’t want to paint the Singapore River, and he certainly didn’t want to please tourists. By proposing to encapsulate an (imaginary) image of the Singapore River with a blank 5 feet by 5 feet area that straddled the wall and floor, Cheo wanted the audience to feel uncomfortable, curious and be sufficiently wound up for (future) conversations. The art wasn’t just the oddly positioned square, it was the act of submitting the work/idea, the debate that surrounded it, and the conversations that continues. By accepting the work was ‘made’ because it was written and documented, even without exhibiting it in the 1970s, we might begin to understand the appeal of and confusion with conceptual art. Some might sympathise with Cheo when Ho Ho Ying, presumably a curator for the 1972 art exhibition disregarded this conceptual gesture, preferring art that had a physical presence and form; others might applaud Ho for entertaining Cheo’s ideas, which no doubt was a defining moment in Cheo’s artistic career. Ho, a bastion of modern art might have wanted to challenge Cheo’s artistic beliefs, pressing Cheo to fight for his own aesthetic sensibilities. This heroic interpretation perhaps conforms to some art historical interpretation that great art resists, and counters the art before its time. 5’ x 5’ might just be Singapore art history’s point in case. There are several curatorial decisions in this exhibition worth noting, that challenges our understanding of art before and today. Cheo’s 5’ x 5’ is re-presented in text, as a projected white area of light, and with rope made by the audience, re-shaped, re-made, stepped on, taken home and ultimately remembered. While all art potentially contains a concept, or idea, I would argue that a conceptual piece of artwork escapes (physical) form, as illustrated here. So adding audience interactivity is specific to Cheo’s work, and may not work for all art exhibitions. By laying the artist’s brief biography in text from floor to wall in black vinyl text, it suggests that the biography of the artist and the ‘life of the artwork’ are inextricably linked. Not everyone can call a 5 feet by 5 feet shape an artwork and get away with it. If 5’ x 5’ was a defining moment in Singapore’s art history, as it is re-presented in iconoclast series, what other artworks might we uncover, besides those collected by the National Heritage Board? What do artists and art historians interpret, write and talk of them? For comparison, the curator had presented a few reproductions of paintings of the Singapore River, illustrating what the Singapore River meant (pictorially at least) to different artists. What is missing from such a complete exhibition, despite the large empty walls, is the viewer’s interpretation of the Singapore River, rather than a re-interpretation of Cheo’s 5’ x 5’. If readers, curators and artists can sympathise with this view, then we can begin to understand why re-presenting the Singapore river, in picture, photograph or in a sonnet, are equally valid. And personal. Evident in this exhibition, artists find inspiration from texts–those that are “performed upon, around and through the written and spoken word”.Texts are constructed with fixed words in a given language, yet their meaning changes depending on the context they were used and the circumstances they are comprehended by the reader. The manner in which they are analysed and understood is often taken for granted. Texts, placed in the hands of artists, spur our imagination quite differently then the hands of the book authors. Fluency becomes less of a concern, as the work then seems to be made for a select, privileged audience. Yet, The artworks seen here is also akin to reading short stories. The shorter they are, they provide more room for imagination, and require the reader to work hard to grapple with each word worth its weight in gold. The shortest story I’d ever read was Double Negativeby Lydia Davis, consisting of one sentence. Artists might read books for various reasons. Getting the audience to use white gloves to handle the books might reveal the relationship artists have with their books. Similarly, a smile, a frown, the use of gloves yet flipping the books nonchalantly, handling the books with care or the sign of irritation on a viewer’s face might reveal their relationship to books too. Texts surround us and can take many forms. In this exhibition, texts could take the form of literature epics, non-fiction reference books dealing with psychology, scientific journals or graphic novels. Like most prescribed literature in English textbooks, the artworks here explore the human condition and expound on a range of issues that are moral, ethical, social, psychological, or signifying conflict. Mounted on aluminium and hinged like a book, each artist text takes a physical form and sits perched on a shelf, overlooking proud displays of published books. Each text in its most abstract interpretation resemble a restaurant menu of sorts, waiting to be decoded, knowledge ordered and consumed. According to Samuel Johnson, “Knowledge is of two kinds. We know a subject ourselves, or we know where we can find information upon it”. Often omitted is the follow-on sentences: “When we enquire into any subject, the first thing we have to do is to know what books have treated of it. This leads us to look at catalogues, and at the backs of books in libraries”. Books are precious commodity for the knowledge they contain and represent. Books represent artists’ voracious appetite for knowledge, a source of inspiration for art making or an escape from time and physical space. 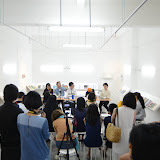 the sampling of participating artists, we might conclude artists are intellectuals and they read a wide spectrum of books. Additionally, by analysing the type of books they are reading at the moment, we might conclude their conceptual interests in relation to their current body of work. Pictures are used sparingly in this exhibition; the gallery space is punctuated by the existing book covers. Arguably, pictures form ‘texts’ too, because they can be ‘read’. For instance, the title of this exhibition possibly sprung from a description of the subject matter in Chua Mia Tee’s Epic Poem of Malaya (1955): a Chinese man captivating a young Chinese audience about an ideal (Malaya), signified by the book in his hand. Texts form narratives. And so do many other visual images–movies, TV commercials, design posters, paintings and photographs—if we let them. Fundamentally, this exhibition allowed the artists to deconstruct their current reads and rekindle our Southeast Asian oratory tradition: social events that accompany the exhibition bring the audience closer to the artworks, the books, the artists and arguably other like-minded readers. It is thus not unreasonable to suggest that the curators of this exhibition simply wanted to spread the joy of reading, and provide an opportunity for the audience to theories how and why artists make conceptual artworks by displaying the source of inspiration. Stonard, JP,. Stone, R. (ed.) (2013). The Books that Shaped Art History: From Gombrich and Greenberg to Alpers and Krauss. Thames and Hudson. Sabapathy, T.K. (2010). Road to Nowhere. The Quick Rise and Long Fall of Singapore Art History. Art Gallery at National Institute of Education.